Losing weight has never been simpler! View how much weight you could lose by a future holiday. Your weight loss projections can be based on your Total Weight Loss, Today's Estimated Weight Loss or your Estimated Weight Loss since your last weigh in. These different samples ensure that you will always have a good idea of how much weight you could lose by a future holiday based on different scenarios. View your total Calorie Intake and TDEE all within one page. 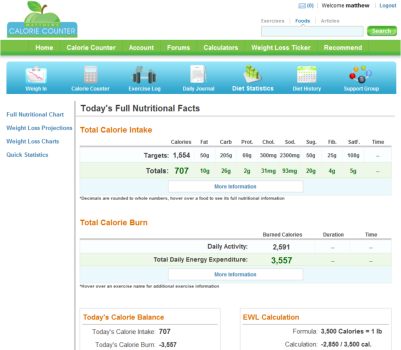 This page also displays your full food journal log with all nutrient total and target values. See how this information is calculated and converted into your final calorie balance for this day's Estimated Weight Loss. Visualize your Calorie Burn vs. your Calorie Intake for today or through this last week within a bar chart. This will help you see where you can improve and stay on track. Also viewable is your Micronutrient Ratios for the day or taken as an average over the last week within a pie chart. See your Fat, Carbohydrate and Protein calorie intake ratios. Comprehensive dietary information, specially tailored to your diet that will allow you to see where you are in your current daily and overall weight loss goals. Other statistics include your current BMI, BMR, your next weigh in date, total weight loss, and an Estimated Weight Loss since last weigh in. Your EWL will give you an idea of where you stand if you cannot get to a scale. Don't have an account yet? - Join Now! Matthews Calorie Counter is 100% FREE. Join now and take advantage of these exciting features! A Daily Journal is offered to help keep you on track and motivated. Take notes on your day’s activities, write down your thoughts on a particular exercise, or keep track of your overall dietary goal. Upload two pictures which will be used to display when you’re within your Daily Calorie Limit and when you go over. This quick visual system will help keep you motivated and on track. Our Calorie Counter will store foods in your Food Pantry based on how often you use them. Features like this will dramatically speed up the process of entering your calories, so you can get on with your daily routine. Maybe you had a rough day, or maybe you just could not get to the computer, whatever the case you can add or edit Foods, Exercises and Journal entries to days you may have missed.